*Clean Skin From Within retails for $22.99, but we bought it for you! We just ask that you pay your shipping / handling to receive it (just $9.95 anywhere in the Continental USA). Your information is secure and will not be shared. If you struggle with imperfect skin (and who hasn’t? )… it can be incredibly frustrating to deal with things like redness, bumps, fine lines, and skin discoloration. And if you’ve tried conventional medicine to deal with skin issues, or tried to cover up with concealers and makeup only to be disappointed – you’re not alone. If you really want to have naturally clean, glowing, more youthful looking skin. If you’d like to stop suffering from skin conditions, or simply want to see just how great your skin can really be – then I have great news for you. You don’t have to suppress or cover up your skin issues, and you can have naturally beautiful skin. There’s an actual process for healthy, glowing skin, and I’d love to share it with you. I’ve always had finicky skin. I had hives and eczema as a child, acne as a teenager, and rosacea in my 30’s. You name it and I’ve probably had it. But after years of antibiotics, antihistamines, and steroids I was introduced to a natural, holistic approach that changed everything. So much so that I decided to pursue medicine and become a Naturopathic Doctor so I could help others, like you, overcome skin issues and discover your natural beauty too. Your skin is a magic mirror to what’s happening inside your body. Common prescriptions usually do not fix the true underlying problems. Your skin has a delicate pH balance and community of bacteria that are crucial for its health. The foods you eat can affect your skin in a big way. Skincare products you put on your skin affect your internal health. To have the glowing skin and vibrant health you deserve then, you’ve got to pay attention to what your skin is telling you, so you can get to the root causes and give your skin and body what they need to look and feel your best. Every day, your skin is giving you messages about your health. Your skin offers clues about how healthy your habits are, and what’s happening inside your body. When you look at what’s happening on the surface of your skin and understand the causes behind symptoms… it’s much easier to make small changes to improve how you look and feel. I had some big issues with my skin and my body, rosacea, some dry skin, and even acne. I followed Dr. Cates advice, used her products, and made a few changes in my diet and what a difference in myself inside and out! As a board-certified plastic surgeon, I find Dr. Cates approach to be enlightening, encouraging, and effective. The true path to our skin’s health lies not in costly and painful procedures, but in what we put in our mouth and on our skin. Dr. Cates’s book is a one-of-a-kind. Great book! So important to address inner health in order for our skin to reflect our wellness by looking healthy and vibrant without the use of chemicals and other toxic ingredients! What’s Holding You Back From Clear, Glowing Skin? There’s a good chance one (or maybe all) of the Six Causes of Imperfect Skin are holding you back from clear, glowing skin. > Identify the specific combination of causes affecting your skin. > Determine your Skin Type so you can address your specific skin problems. > Naturally improve your skin from the inside out. > Achieve the glowing skin and vibrant health you deserve. Enjoy delicious anti-inflammatory foods and recipes that support your liver, kidneys, and digestion, and avoid common foods that trigger skinflammation. Discover how to replace toxic ingredients in your skincare routine with cleaner, effective alternatives, and reduce toxins in the air, as well as the water and food you consume. Find herbal and nutritional supplements that boost your liver and kidney function and enjoy ancient, spa-cleansing techniques used by world-renowned spas for enhanced toxin removal. Identify and remove emotional triggers that negatively effect your body, mind, soul – and skin. 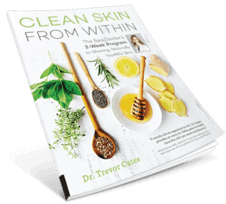 The results of the CLEAN SKIN FROM WITHIN 2-Week Program are delicious meals, toxic-free skincare, and a healthy mind and body! YES! I Want My FREE Copy of CLEAN SKIN FROM WITHIN! YES! I Want My FREE Copy ofCLEAN SKIN FROM WITHIN!